0.5 μg of Human Anti-VEGF Antibody, MCA6089 (bevacizumab biosimilar, research grade) and bevacizumab (therapeutic reference product) were denatured and analyzed under reducing (R) and non-reducing (NR) conditions. Bands were visualized using Coomassie Blue staining. Full IgG (H2L2), heavy (H) and light chains (L) are indicated. 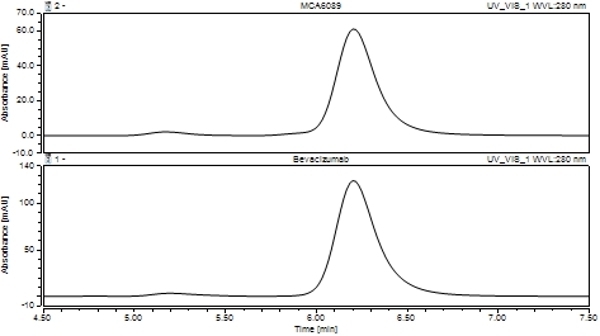 Size exclusion chromatography (SEC) of Human Anti-VEGF Antibody, MCA6089 (bevacizumab biosimilar, research grade) and bevacizumab (therapeutic reference product) was performed on an analytical HPLC instrument. Shown are monomer peaks (H2L2), calculated relative monomer portion and aggregates. Column: MAbPac SEC-1, 5 μm; dimension: 4.0 x 150 mm; mobile phase: 50 mM sodium phosphate, pH 6.8, 300 mM NaCl; flow rate: 200 μl/min; inj. volume [μl]: 2; temp. : 25 °C; detection: 280 nm; sample: mAb (0.5-5 mg/ml). A microtiter plate was coated overnight with Human Anti-Bevacizumab Antibody (clone AbD17976, HCA182) at a concentration of 1 μg/ml. 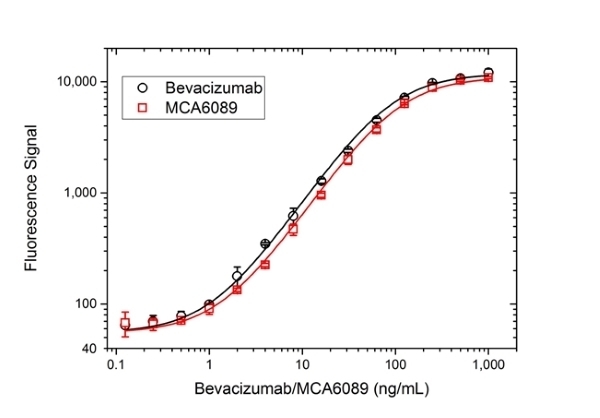 After washing and blocking with PBST + 5% BSA, 10% human serum was added spiked with increasing concentrations of bevacizumab (therapeutic reference product) or Human Anti-VEGF Antibody, MCA6089 (bevacizumab biosimilar, research grade). 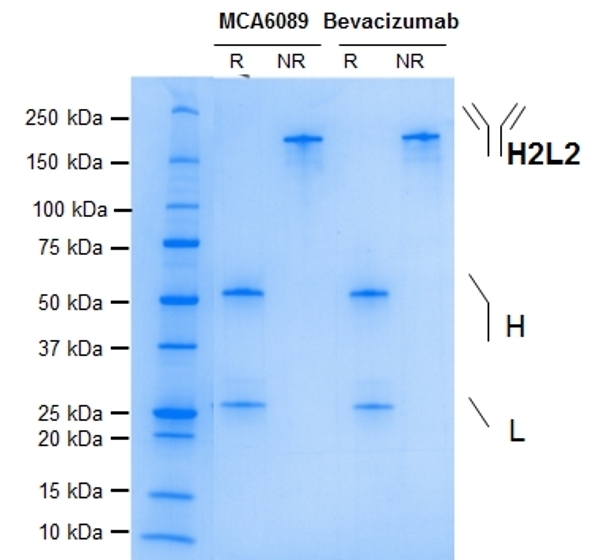 Detection was performed using HRP conjugated Human Anti-Bevacizumab Antibody (clone AbD17976_hIgG1, HCA185) at a concentration of 2 μg/ml in HISPEC Assay Diluent (BUF049A) and QuantaBlu Fluorogenic Peroxidase Substrate. Data are shown as the mean of three measurements. HRP conjugation of the antibody used in this assay was performed using a LYNX Rapid HRP Antibody Conjugation Kit®. Anti-VEGF Antibody is a non-therapeutic biosimilar of the monoclonal antibody drug bevacizumab (Avastin) for research use. It can be used in bioanalytical PK and ADA assays and for studying biological pathways affected by the drug. Human Anti-VEGF antibody is a research grade biosimilar of the monoclonal antibody drug bevacizumab. It is a recombinant human IgG1 kappa antibody with variable regions from the therapeutic bevacizumab antibody clone. This antibody is for research use only. It is suitable as a reference standard in a pharmacokinetic (PK) bridging ELISA with anti-bevacizumab antibodies, for example HCA182 and HCA185. It can also be used as capture and detection reagent in an anti-drug antibody (ADA) bridging ELISA, with an anti-bevacizumab antibody in IgG1 format as a reference standard, for example HCA184 or HCA185. Bevacizumab, also known as Avastin, is a humanized monoclonal antibody (IgG1 kappa) that inhibits angiogenesis by binding to VEGF-A. VEGF-A stimulates new blood vessel formation in certain diseases, especially in cancer. Avastin is used to treat various cancers, including colorectal, lung, breast, glioblastoma, kidney and ovarian. View a summary of supporting anti-bevacizumab antibody products.